The BJP chief submitted his nomination form to the Gandhinagar district collector and returning officer S K Langa. 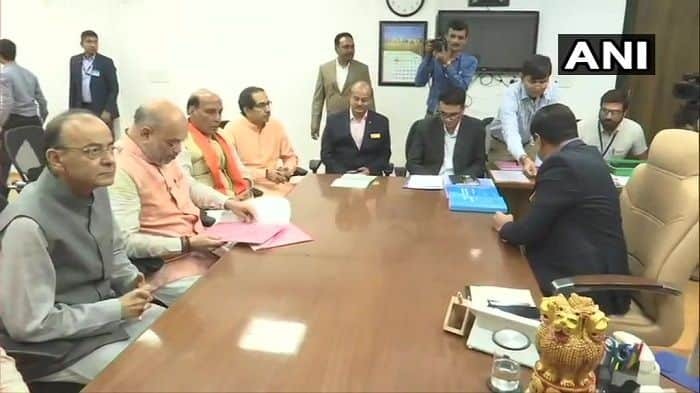 New Delhi: In a mega show of strength, BJP national president Amit Shah, accompanied by Union Finance Minister Arun Jaitley, Home Minister Rajnath Singh, Shiv Sena chief Uddhav Thackeray and Gujarat Chief Minister Vijay Rupani, filed his nomination papers for the Gandhinagar Lok Sabha in Gujarat on Saturday. Earlier in the day, Shah addressed a rally with the National Democratic Alliance leaders and conducted a roadshow in Ahmedabad. Lakhs of people greeted Shah on the four-km route from where his road show passed. Union ministers Rajnath Singh and Piyush Goyal, Gujarat Chief Minister Vijay Rupani and Deputy Chief Minister Nitin Patel accompanied Shah in an open vehicle during the roadshow that started from Sardar Patel statue in Naranpura area in Ahmedabad. BJP workers and people thronged the street to greet Shah, who is contesting the Lok Sabha election for the first time. The BJP now aims to retain all the 26 Lok Sabha seats in Gujarat it had won in 2014. The roadshow ended at Prabhat Chowk area of Ghatlodia, after which Shah left for Gandhingar to file the nomination papers. Before embarking on the road show, Shah also addressed a rally in Ahmedabad, where leaders of BJP’s allies such as Shiv Sena chief Uddhav Thackeray, SAD supremo Parkash Singh Badal and LJP founder Ram Vilas Paswan were also present on the stage. Shah has replaced BJP veteran L K Advani, who had been winning uninterrupted from Gandhinagar since 1998, from the prestigious constituency. Amit Shah’s nomination from the Gandhinagar seat has marked a generational shift in the BJP. As an MLA, Amit Shah had earlier represented Sarkhej constituency. After delimitation, he was an MLA from Naranpura constituency. Both the seats were under Gandhinagar Lok Sabha constituency.